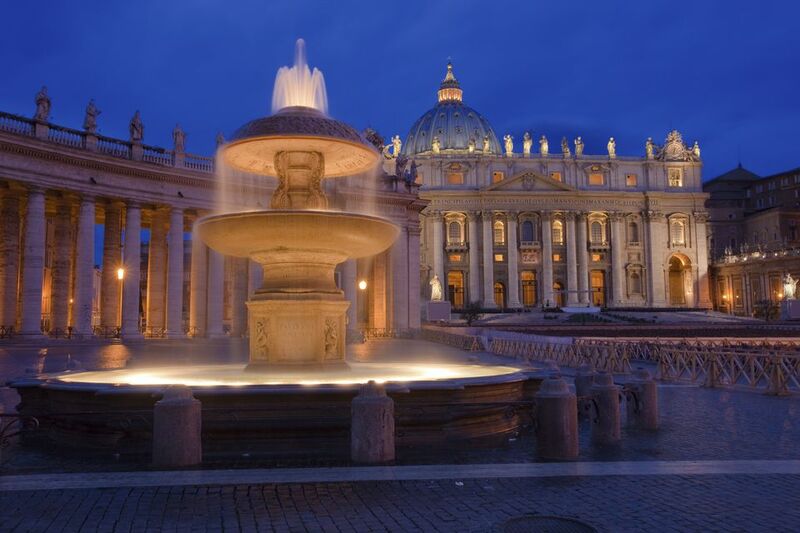 Almost every square in Rome and the Vatican City is adorned with a beautiful fountain at its center. Like so many other elements of Rome, these fountains are pure works of art and several are tourist attractions in their own right that you won't want to miss on your trip to Italy. Plan your vacation to Rome, Italy with the following list of Rome's most famous and most lovely fountains in mind to make sure you get a chance to see some of the city's most celebrated public attractions including the world famous Trevi Fountain (don't forget to make a wish!) and the fountains at St. Peter's Square. The most famous fountain in all of Italy is the Trevi Fountain, an over-the-top Baroque masterpiece completed only in 1762. At all hours of the day, the Fontana di Trevi is thronged by tourists who visit it to throw coins into its pool in the hopes that this practice will ensure a return trip to Rome. Other than the cost of a coin or two, it costs nothing to see the Trevi Fountain, making it one of Rome's Top Free Attractions, and it has been featured as a backdrop for several of the top movies set in Rome. Having undergone a thorough cleaning at the end of 2015, it's now open and back to its dazzling white beauty, so be sure to check out the Trevi Fountain in all of its glory on your trip to Rome this season. One of the most prolific artists in Rome was Gianlorenzo Bernini, who was active artistically from 1622 through 1680. In addition to breathing life into the marvelous marble creations that can be seen in the Borghese Gallery, Bernini sculpted several fountains in the city, the most famous of which is the Four Rivers Fountain in Piazza Navona. Other Bernini fountains appear across the city, including the Fontana del Tritone in Piazza Barberini and the Fontana della Barcaccia just below the Spanish Steps. Find out more in where to see Bernini's art in Rome in our guide to the artist's work in Italy. Dating from the 19th to the early 20th centuries, the Fontana delle Naiadi, or the Fountain of the Nymphs, is perhaps Rome's most sensual fountain. This large fountain, which decorates the Piazza della Repubblica, features a central pool on which Glaucus, the Water God is perched surrounded by four naiads (nymphs) which represent the four types of water: the rivers, the oceans, the lakes, and the underground aquifers. A diminutive fountain in an out-of-the-way square, the "Turtle Fountain", Fontana delle Tartarughe, is worth seeking out. Designed by Giacomo della Porta, who also designed the fountains on either end of Piazza Navona, this playful fountain features four male figures propped up on dolphins and assisting tiny turtles into the small pool above them. Located in Piazza Mattei in the Jewish Ghetto neighborhood, not far from Campo de' Fiori, the fountain is a nice diversion and the neighborhood is a good place for a stroll, too. Although not technically in Rome (Vatican City is a small, independent country), Saint Peter's Square is often visited on a trip to Rome. There are two fountains in the square, one erected in the early 17th century and the second added by Bernini when he created the square in the mid-17th century. Although the fountains aren't the primary interest in the square, they are certainly worth a look! This article has been updated and edited by Martha Bakerjian.